Tombstone from Kilarrow churchyard, drawn by John Frederick Miller in 1775 from a sketch taken in 1772. Nothing remains of the village of Kilarrow (Killaru) apart from the churchyard. 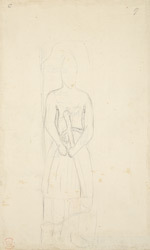 This is a pencil preparatory sketch for a later ink drawing of a soldier's tombstone.